In case you haven’t heard of me before, my name is New Jersey Nick, and I’ve been scouring the Garden State looking for all the best Good Food That’s Bad For You. Burgers, Fries, Dogs, Burritos, and anything else that you need to jog off the next day. No fancy places for me. Just burger joints, diners and haunts favored by adventurous eaters and carnivores alike. I find the best places, and I hope you go give them a shot. 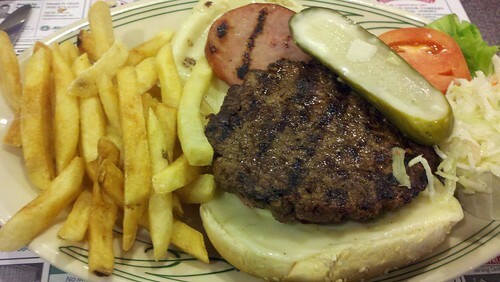 Today, I take on a burger from The Hillsborough Star Diner.I love finding good diners. Not diners that just have great breakfast. Not diners that just have cool burgers. But diners that focus on upping the quality of every meal. 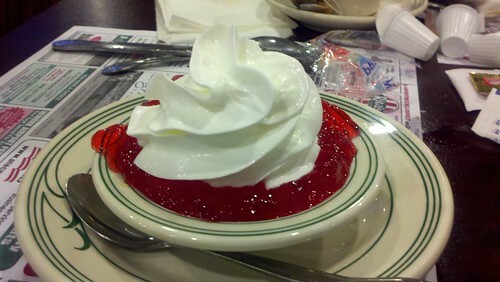 The phrase ‘restaurant quality’ was created for places like the Hillsborough Diner. The Place – On the inside, the palette of the restaurant is based on its dark wood and brick interior. Some of the booths are built into brick coves, giving you some privacy, which is cool. Also, there are open tables in the dining room, if the private tables prove to tight for you. The Menu – At first, the menu seems like what you’d expect from a New Jersey Diner. There’s a ton of breakfast items and diner faire like triple decker club sandwiches and specials. But at the Hillsborough Star Diner, they also have a hoagie selection, unique picks like the crab melt sandwich and a sizable burger menu. I’ll get to the burgers in a sec, though. Let’s talk a little more about all the other good stuff first. Free rolls! 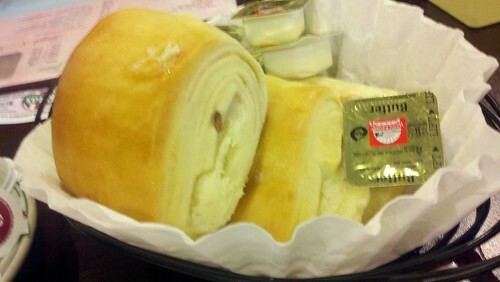 Maybe it was just because I showed up at dinnertime, but we got free rolls with our meal. And they weren’t your regular dinner rolls either, they were warm and fresh sweet rolls! Ok, I get it. The rest of the world might not care about this as much as me, and they may have been just Pillsbury straight-outta-the-can rolls, but I was pretty excited about them. Another item on the menu we tried during this adventure: The Beef Stew. I don’t think I’ve ever included a Beef Stew in one of my reviews, so this is a first. 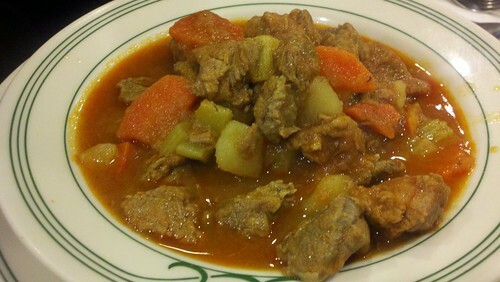 The Hillsborough Star’s beef stew with chunks of tender beef, not too chewy, was a surprise. It had a rich, full flavor that made it taste very similar to the homemade stew my wife’s Mom makes which is a pretty remarkable find for a diner because my mother-in-law is an excellent cook. Appetizers – As for the starters, they had the regular appetizer selections you’d expect from a diner like Mozzarella sticks, quesadillas and onion rings, but I was intrigued when I saw the Chicken Nuggets on the menu. 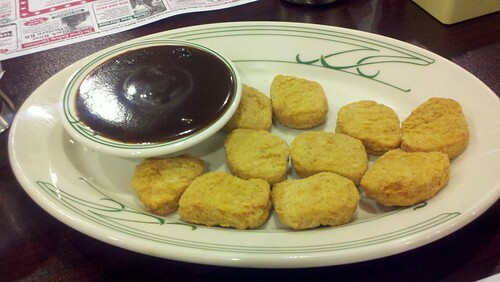 I don’t think I’ve ever seen Chicken Nuggets available at a diner before, so I had to see what it was gonna be like. It was pretty much exactly what I expected: previously frozen Nuggets O’ Chicken served with a giant bowl of barbeque sauce. I didn’t mind that it was kind of underwhelming, because, really, it was still way, way better than Mcdonald’s. 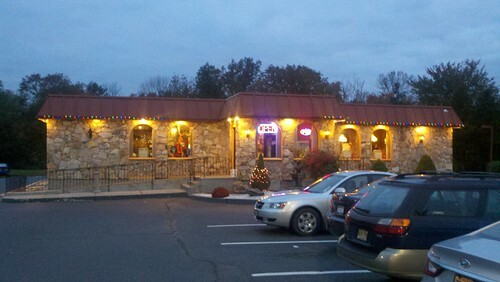 The Burgers– The Hillsborough Star Diner had a lot of burgers on the menu. There were the old standbys like a Bacon Cheeseburger and a California Burger. Plus, there were other unique Choices like the Mix Burger with Mozzarella cheese, sauteed green peppers and mushrooms or the Reuben Burger that is topped with Russian Dressing and Swiss Cheese. Also, there alternative meats like Buffalo and Turkey Burgers, and even a Veggie Burger. There were a lot of different burgers that I wanted to try here, but I went for the Canadian burger. Before you go mocking me as being un-American, give me a chance here. This burger was pretty great. It was topped with a slice of mozzarella and also a piece of Canadian bacon. The mozzarella and bacon were good, but the beef was the star of the show. 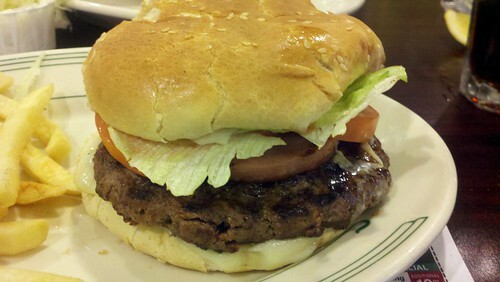 The big ground beef patty made it a juicy diner burger, and I mean juicy, not greasy. When I first bit into the burger, I thought they only put cheese on the bottom, which always annoys me, but it turned out that both sides of the beef had Canadian bacon and mozzarella cheese on it. That was a nice touch. Overall, it was a Damn good burger. 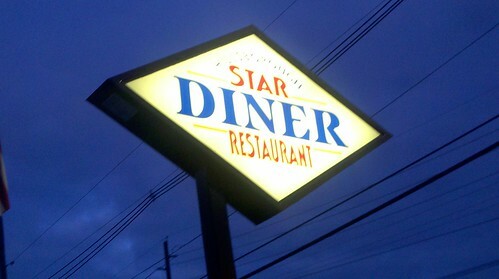 I was really happy that I tried the Hillsborough Star Diner. Its a great diner that’s way above average! The phrase ‘restaurant quality’ applies here, as their dishes are made with heart and even approach the quality of dear old mom’s cooking! They clearly care about their quality level and want to give you a good meal, so why not have one?